At Wesley Medical Center, you'll find that caring extends to both our patients and our people. 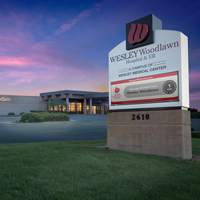 Take your career to the next level at Wesley Woodlawn Hospital & ER. If you have a desire to grow in your career, please reach out to us! Not only do we offer our patients the most cutting-edge healthcare possible, but we do it in an environment that has the look and feel of a great community hospital. We'd like you to consider becoming a valued employee of one of our hospitals – where our number one commitment is to the care and improvement of human life. Our care is patient-centered, neighbor to neighbor, as well as innovative and life-saving. Welcome to Wesley Healthcare! Our mission is: above all else, we are committed to the care and improvement of human life. We strive to meet this mission with every interaction. All of us have different jobs, but at our core, we are all committed to improving the lives of our patients and families. And that is what Wesley is all about.